Los Jardines de Zoraya is a Spanish restaurant which is dedicated to the art of Flamenco. It is therefore not just a restaurant but a 'tablao' as well, or in other words a Flamenco bar. The menu at Los Jardines de Zoraya is comprised mostly of Spanish and French food, many of the dishes originating in Andalusia. The original restaurant was called Café au lait and it first opened its doors in 2002 in its original location on the 'Plaza Romanilla' (Steelyard Square), close to the Cathedral of Granada. They began having Flamenco shows just one day a week, but because it was so popular, the restaurant decided to have a Flamenco show everyday of the week. 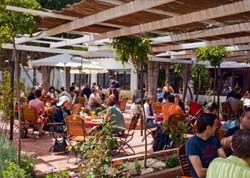 Los Jardines de Zoraya was then opened in 2008 in Albayzin, a small town in the mountains to the East of Granada, with the attention of increasing the capacity of people for whom they could cater. Their aim was certainly achieved as the new restaurant could seat 100 people inside and a further 150 out on the terrace. Los Jardines de Zoraya still occupies this spot up in the Sierra Nevada mountains, overlooking the city of Granada. Today the restaurant puts on two Flamenco performances a night during the week, and four at the weekends. The restaurant is very passionate about the authenticity of its Flamenco performance and so they hire only the very best professionals. Recently, the famous Flamenco dancer from Granada, Ana Calí, has taken time out of her busy schedule to perform at Los Jardines de Zoraya. 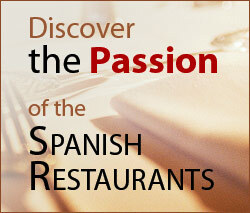 This means you can be assured that experiencing the Flamenco here is a truly authentic form of cultural immersion. Currently, this Spanish restaurant is run by Miguel Moreno Riojas. Miguel Moreno Riojas was born in France but has Spanish parents; a mixture which he has brought to the kitchen of Los Jardines de Zoraya. All of the staff at Los Jardines de Zoraya are extremely switched on and know their food and drink well. You can ask anyone of them to advise or inform you about the dish that you're eating or what wine should accompany which dish. The building that houses the Los Jardines de Zoraya restaurant is typically Spanish, with its tiled roof and white washed walls. Inside the traditional feel continues with the use of decorative floor tiles, wooden beams on the ceiling and the use of dark brick. Outside is the huge terrace which consists in both a covered and an open air section. Wherever you sit on the terrace, you can really appreciate the beauty of your surroundings; from the rustic buildings, to the nearby mountainside, to the pretty, Arabic-inspired fountain in the middle of the terrace. If you love your Spanish culture, then this is definitely the place to go when you visit Granada. The cuisine at Los Jardines de Zoraya is broadly speaking Mediterranean as it combines a variety of dishes and recipes from within Spain as well as some from France, mostly due to the influence of the head chef, Miguel Moreno Riojas. The main menu at this Spanish restaurant includes such dishes as 'Solomillo de cerdo con salsa mozárabe' (Pork Sirloin steak with mozarabic sauce), 'Lubina a la espalda con salsa de granadas' (Sea bass cooked skin side down with Granada sauce), and 'Gambones flambeados al whisky' (Prawns flambéed in whisky). Aside from the main menu, Los jardines de Zoraya also offers some set menus such as the menu for groups and a Flamenco Menu. The Flamenco Menu is a set meal which includes the price of the Flamenco performance. This is where you can find the most authentic Spanish dishes which have been chosen to mirror the Spanish tradition of Flamenco.